On 16 September, design is coming to town. We can’t wait – the programmes for both the London Design Festival and the Service Design Fringe look amazing. It’s a great chance to catch up with all our partners and friends, and hopefully meet some future collaborators. It’s also a great chance to talk to all of you about the things that preoccupy us: what does design mean in a policy-making context? How do we take the principles and practices from the design world and apply them to complex problems? What does ‘prototyping’ for policy look like? It’s a bit easier to understand when it’s a toaster or a mobile phone – but what about when it’s a complex healthcare provider ecosystem? Does design need particular conditions or space? The first, on Wednesday 20th September, is a small gathering of experts in the field of design research. We’ll hear from Prof. Lucy Kimbell and Jocelyn Bailey amongst others as we consider what is unique about design research and how it might contribute to better policy-making. 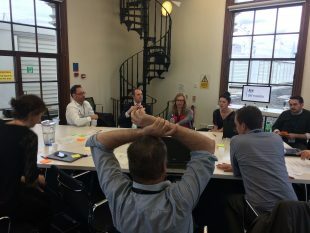 Spaces are limited, but please get in touch with policylab@cabinetoffice.gov.uk if you would like to be part of the conversation. The second, on the morning of Thursday 21st September, is an open house-style seminar about SKYroom – the innovation space we use here at 1 Horse Guards Road. We developed the concept in partnership with IDEO, workspace innovation expert Kursty Groves and the Royal College of Art. Kursty will join us to discuss our vision and objectives, and the innovation principles that we think apply across sectors. Again, spaces are limited, so make sure you sign up on the London Design Festival website. Finally, later in the day on Thursday 21st, we’ll be joining forces with Snook, partners on our private rental sector project, to get you involved in designing research tools. We are going to design prototypes which help us learn more about how to make the experience of renting better for both tenants and landlords. This means getting stuck in and making tangible artifacts and things we can show people to help us learn more about their wants and needs. Sign up through the Service Design Fringe website. It will be a busy week with loads to choose from, so we won’t be offended if you don’t manage to get to all our events. But if you’re anywhere near London that week, do try and go to at least one design festival or fringe event – there’s always so much energy and loads of interesting people to meet. We hope to see you then.